I love what Jaime from A Prudent Baby did to her backyard as it is the most successful example of what lots of easy and clever DIYs can do to decorating a place on a dime! I have to admit the colors she picked are a favorite summer palette of mine and the splashes of black on the chairs and chevron pattern only enhance the soft pastel hues of peach, pinks and mints. You can visit A Prudent Baby to find out more about this project plus get a glimpse of extra shots! P.s. I'd probably hang one of these if I had such a cool backyard! Found via the escape artiste. 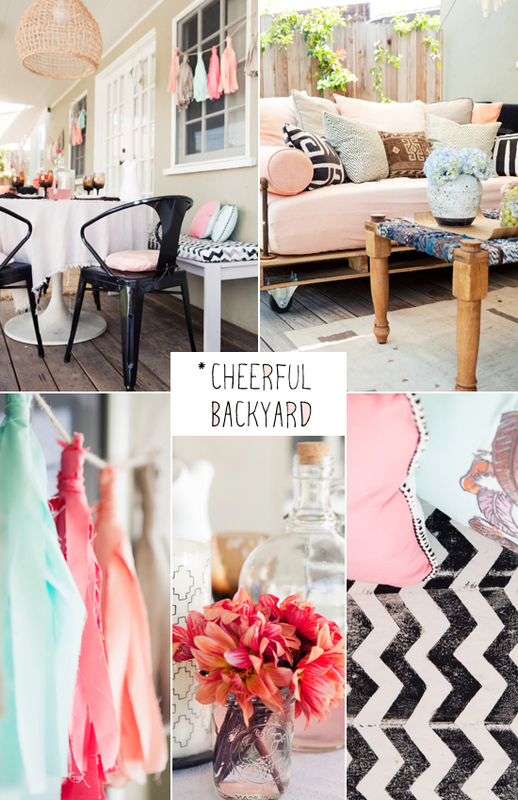 3 comments on "A cheerful backyard"
Oh ,I love the colours! Prettiest backyard ever! Those colors are perfect! Beautiful! A lovely place to enjoy. I love the colors.